A joint venture is a form of business enterprise under-taken by two or more persons or organizations to share the expenditure and revenue of a particular commercial project. It is established in management literature that a joint venture is an association of two or more units combining property and capability to perform a single business enterprise. The entities can be corporate, governmental, or individual. A Joint Venture can be defined as a contractual arrangement between two corporations, aiming to start a specific task. In a partnership, associates decide to share the profits and take the burden of loss suffered. Joint ventures enable firms to access each other's complementary resources and capabilities in order to attain economies of scope and/or scale, and to develop new products faster, more reliably, and more inexpensively than could be done by either firm acting alone or through acquisition. In the decade of 1990, there were revolutionary changes occurred in organizational structure. Numerous multi-national corporations, such as Chrysler, Shell, Dupont, Xerox, Hewlett Packard, IBM, and AT & T have reoriented their corporate structures to incorporate multiple joint ventures in manifold markets at global scale. In the period of 1800's, joint ventures had been a support of American business and it played effective role in this country's developmental years in the shipping, railroad, mining, and oil industries. Currently, the joint venture has taken on a significant role in extending the arena of possibilities for innovation and financial rewards. A joint venture is formed through a contract between the parties. The contract may include two or more agreements. The agreement is entered into between individuals, or organizations. The parties enter into specific agreement to do an enterprise for profit. A contract, express or implied, between the parties, is crucial to create the relation of joint ventures. However, there are less formality to the establishment of a joint venture and an agreement is not invalid because of indefiniteness with respect to specifics. A formal agreement is not required to establish a joint venture. The contract need not particularly identify or define the rights and duties of the parties. The relationship can be formed by parol agreement. The agreement entered into between the parties must indicate the intent of the parties to enter into a joint venture. Usually a joint venture is established for a specific purpose and for a specific limited duration. The indispensable test in determining the existence of a joint venture is whether the parties intended to establish such a relation. In the absence of an express agreement setting forth the relationship, the status can be inferred from the conduct of the parties in relation to themselves and to third parties (Martin, 1981). A joint venture is not just a contractual relationship. Certain contributions are made to a newly formed business enterprise. Each member in a joint venture contributes property, asset, capital, skill, knowledge or effort for a common and specific business purpose. Parties in a joint venture share a common belief regarding the nature and amount of the expected financial and intangible goals and objectives of the joint venture. Typically goals and objectives are narrowly focused. Assets deployed by each participant represent only a portion of the overall resource. Each member enjoys the right of control over the other (Christensen, 1991). The contract must include provision regarding the sharing of profit and loss. The joint venture parties share in the specific and recognisable financial and intangible profits and losses. Moreover, the members share certain elements of the management and control of the joint venture. Spreading Costs: Business person and a Joint venture partner can share costs associated with marketing, product development, and other expenses, reducing your financial burden. Opening Access to Financial Resources: Businessperson and a Joint ventures partner might have better recognition or more assets to access many resources for loans and grants than company could obtain alone. Connection to Technological Resources: Company cannot afford technological resources at its own. Sharing innovative and proprietary technology can improve products, as well as your own understanding of technological processes. Improving Access to New Markets: Company and a Joint venture partner can combine customer contacts and together even form a joint product that accesses new markets. Help Economies of Scale: Through joint venture, enterprises can develop products or services that reduce total overall production expenses. Develop Stronger Innovative Product: Business person and Joint venture partner both may be able to share ideas to develop a product that is more competitive in industry. Improve Speed to Market: With shared access to financial, technological, and distribution resources, Business person and Joint venture partner can get joint product to market faster and more competently. Strategic Move against Competition: A Joint venture partner may be able to better compete against another industry leader through the combination of markets, technology, and innovation. Share and Improve Technology and Skills: Two innovative corporations can share technology to augment each other's ideas and skills. Diversification: There could be many diversification reasons such as access to diverse markets, development of diverse products, diversify the innovative working force. The explosion of joint ventures is being driven by a multiplicity of forces. Joint ventures may be either contractual or structural, or both. 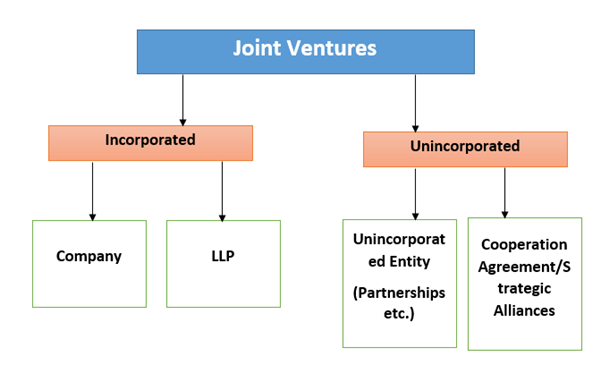 Major classification of JVs is as equity/corporate Joint ventures and contractual Joint ventures. An equity Joint ventures is an arrangement whereby a separate legal entity is created in accordance with the agreement of two or more parties. The parties undertake to provide money or other resources as their contribution to the assets or other capital of that legal entity. This structure is best suited to long-term, broad based Joint ventures. The contractual Joint ventures might be used where the establishment of a separate legal entity is not needed or the creation of such a separate legal entity is not feasible. This agreement can be entered into a situations where the project involves a temporary task or a limited activity or is for a limited term. There are three different partnership structures in joint venture. A traditional partnership could be chosen, a limited partnership or a limited liability partnership (LLP). LLPs are treated as a separate legal entity, whereas limited partnerships and traditional partnerships are not. Both limited partnerships and LLPs offer limited liability, which means that the partners are not automatically liable for the debts of the partnership. If a joint venture partner transfers a capital asset into the partnership, the transfer will be treated as the disposal by the joint venture partner of a share in the asset in exchange for a share in the assets contributed by the other joint venture partners. This could give rise to a tax liability for the joint venture partner. In a contractual form of joint venture, the parties do not establish any separate entity to carry on the venture. Instead the parties enter into contracts and make their own profits and losses. They pay tax only on their own profits. Contractual joint ventures are used by parties to combine resources to bid for the award of a contract or to undertake joint research. Main benefit of contractual joint ventures is that there is no joint and several liability for the losses of the venture. Many management scholars have affirmed that Joint Ventures is a tool to generate wealth and freedom, to help small businesses survive and succeed, to build strong relationships between good businesspersons and permit people to recuperate their self-esteem and self-respect. Joint ventures can be very effective mechanism for strategic growth. Such unions can enable fast access to new skills and technologies. Joint ventures can secure production capacity and lower cost production, offer access to both local and distant markets, and offer ways of creating economies of scale and market power (J. Peter Killing, 1983). Always seek for strong partners. Make sure that businessperson's contribution to the deal is equal to his/her partner's. An uneven partnership is not good for either party. Avoid partners that is not trusted. If possible, limit the scope of the venture in the beginning and extend it as trust increases. Make agreements simple, but put them in writing. To avoid misunderstandings after the venture has begun, recognise the value of each partner's contributions at the outset. These should include skills, intellectual resources, marketing resources, capital, and so on. In determining the value of those contributions, remember that fairness is not an exact number, but a range. Try to be flexible and favour associates who show the same flexibility. Establish clear protocols at the beginning for amending or unwinding the relationship if it fails to meet expectations. Goodwill is important for success. It entails that businesspersons want their partner to benefit from the relationship as much as they do. Access to new technologies: Access to the modern technologies is certainly required for companies to grow their business and to enter into the global markets. A joint venture can provide a growing business with technology from a participant that it will not otherwise be able to develop due to costs, resources or time constraints. The right new technologies can offer the new business with a spring board into new markets and products. Cost Reduction: Generally, company alone cannot manage all the things but a joint venture may be able to provide a growing business with the technology, manufacturing or distribution capabilities that it could not otherwise afford. This type of partnership allows the amalgamation of collective strengths that makes it more likely for all contributors to prosper. Learning Opportunities: Joint venture permits the members to work with other businesses in the same or related industries. This provides participants with the opportunity to learn from each other's successes and faults. It may also lead to a consistent transfer or collaboration of information, business practices, operational processes and technology. Tax Transparency: Tax transparency ( with profits and losses being treated directly as those of the partners in their proportionate shares) may be beneficial for tax planning purposes and may allow the associates to attain more effective tax relief or capital expenditure or losses. No Public Filing: The lack of any need to suffer publicity or expense in making filings with any regulatory body (such as the company's registry) can be an advantage. It is concluded that Joint venture helps an organization to enter in to new markets or new product lines. JV helps to build credibility with a particular target market by choosing a well-established and credible partner in that market. It reduces risk involved in business due to sharing of losses and expenses. Partners in Joint Ventures get preference in buying out the shares of other partners and take over the company. Loss of Competitive Advantage: An association with an actual or potential competitor, as is often the case with alliances may endanger the cooperative benefit that the business might otherwise have developed in the absence of the relationship. The increasing business must determine before entering into an alliance whether such opportunities and goals can be achieved without the assistance of the competitors or whether the price of such opportunities and goals in excessive in light of the overall objectives of the business and entity. Lack of Control: It does not matter how the alliance is organised, participants certainly will lose some aspect of control over the project. In order for participants to gain, they must also give something up, which is usually control of some aspect of their business and, in turn, rely on the other participants. Therefore, it is important that participants simultaneously; Structure the management of the alliance in such a manner as to retain as much control as possible without stifling the project and Conduct due diligence on the participants to ensure a level of trust amongst them. Governmental Relations: Coalitions may be made with overseas entities that can lead to substantial opportunities for a growing business. But such alliances must also be watchful of local regulations and government review procedures that may impact the actions of the participants. External Finance: Joint venture provides fewer ways of obtaining external finance compared with a corporate entity. Liability: The shortcoming is the joint limitless liability of each partner for liabilities incurred by the alliance or by any partner acting within the express implied scope of strategic alliance business. Dedication towards the success and long term sustainability of the Joint Venture. Proper planning and research prior to the incorporation of the Joint Venture. Avi-Oil India Pvt. Ltd.: It was established on 4th of November 1993. Joint venture Holders- Balmer lawrie & Co Ltd, NYCO SA, France. Areas of operation are mineral based lubricating oil, defence and civil aviation uses, greases Joint Venture Companies and hydraulic Fluids. This company includes array of hydraulic fluids, protectives, greases in hostile environment. It is also connected with the safety of aircraft with the supply of Aviation and military lubricants. Green Gas Ltd: This Company was formed on 7th of October 2005. Joint venture Holders- GAIL (India ) Ltd & IOCL. This company is known for distributing the oil Gas in Agra and Lucknow. This company has joint venture between Green Gas Ltd and Indian Oil corporation ltd. It provides reliable and safe natural gas to all its customers. Delhi Aviation Fuel Facility Pvt. Ltd.: Date of establishment for this company was 28th of March 2010. Joint venture Holders are BPCL and DIAL. Areas of operation are construction, management maintenance, developing, and designing. This company is formed with the joint venture between Delhi International Airport Ltd and Airport Authority of India with the view of maintenance, designing and modernization. GSPL India Gasnet Ltd.: Joint venture Holders are GSPL, HPCL, and BPCL. Areas of operation are Natural gas pipeline selling. It is a joint venture company which is known as developer in the field of energy transportation. Currently it has its pipeline network in Gujarat. Suntera Nigeria 205 Limited: This Company was established on 9th May 2006. Joint venture Holders are Sunetra resources Ltd, Oil India Ltd. Areas of operation are Investment in gas industry, investment in oil and other upstream sector. Indian Oil PETRONAS Private Ltd.: Company established on 3rd of Dec 1998. Joint venture Holders are Indian Oil, PETRONAS. Areas of operation are Importing and constructing facilities for LPG. Indian Oil PETRONAS is a joint venture between the two fortune 500 companies that meets the purpose of its diverse applications such as heat treatment for automobile components, metal processing, and aerosols. IOT Infrastructure & Energy Services Ltd.: Date of establishment of this company was 28TH of August 1996. Joint venture Holders are GmBH, Germany and Oil tanking. Areas of operation are building and operating terminating services for petrochemical products. This joint venture company not only deals with energy services, rather it is well known logistics and technical solution provider. Indian Synthetic Rubber Limited: This Company was started in 6th of July 2010. Joint venture Holders-Marubeni Japan & TSRC Taiwan. Areas of operation are rubber project in Panipat. The joint venture company also deals with implementation of styrene Butadiene. The projects are launched with the joint venture of Indian Oil Corporation limited and Trimurti Holding Corporation. The branches of the company are well connected with the National highways and railway station for smooth accessibility. Indian Oil Skytanking Limited: Company was formed on 21st September 2006. Joint venture Holders are Skytanking GmbH, Germany, IOT Infrastructure & Energy Services Ltd., Areas of operation are Maintaining aviation fuel facility project, designing, construction. This is a joint venture company between Indian Oil Corporation Ltd and IOT Infrastructure and energy service ltd. It operates from Bangalore and Delhi Airports in India. Indian Oil Ruchi Biofuels LLP: Date of establishment of this company was 28th May 2010. Joint venture Holders are Ruchi Soya, Indian Oil. Areas of operation are Bio-diesel value-chain implementation in Uttar Pradesh. It is a joint venture between Ruchi Soya Industries Ltd which is an Indore based company and Indian Oil Corporation of India having the objective to deal with jatropha plantation . NPCIL-IOCL: Date of establishment of this company was 6th April 2011. Joint venture Holders are Nuclear Power Corporation of India Limited, Indian Oil. This company basically deals with Operation and development of nuclear power plant, developing nuclear energy, generating electricity. This is a joint venture between two well-known companies of India such as Indian oil Corporation of India as well as Nuclear power Corporation. They have an objective of portraying nuclear power as a safe energy for people and environment. Lubrizol India Private Limited: This Company began on 1st April 2000. Joint venture Holders are Lubrizol Inc., USA. Areas of operation are Manufacturing and marketing of lubricants, additives in fuels and chemicals for use. This is a global company which has a drive towards technological advancements. It combines complex specialty chemicals to get customer satisfaction and quality. Petronet LNG Limited: This Company was established on 2nd of Feb 1998. Joint venture Holders are GAIL (India) Ltd, Bharat Petroleum Corporation Ltd, Oil & Natural gas Corporation Ltd., Gaz de France, and ADB. Areas of operation are re-gasification of LNG at Dahej and Koch, developing facilities for import. This is a company with many holders working for the same objective of boosting the Indian energy sector with hard work and strategic planning. Petronet VK Limited: Date of establishment of this company was 21st May 1998. Joint venture Holders include Gujarat Industry Investment Corporation, Petronet India Limited , Reliance Industries Limited & Essar Oil Limited, Infrastructure Leasing & Financial Services Limited. ; Canara Bank. Areas of operation are to operate and construct pipeline for transportation of the petroleum products. This is one of the companies with joint holders as Essar Oil Limited, Canara Bank, Petronet India Limited etc. with the goal of increasing the network of pipeline for transportation. To summarize, Joint ventures can be used as a means of entering a new market for the organisations. Joint venture arises when the company invests in a business in a target country together mainly with a local partner company to share profit. Basically, Firms enter into joint venture agreements in order to create new products and services, enter new and foreign markets, or potentially both (Beamish, 2008).